WHEN: Saturday, April 29, at 6 p.m.
Get Your ArtParty Tickets Here. Whether you come for the fabulous food, the stunning decor, the red-hot jazz music or the incredible works of art, ArtParty 2017: RED promises an unforgettable experience to benefit a great cause. Join us at the Museum along the banks of the waterfall at New Jersey’s most picturesque site for a fabulously chic evening that benefits the Hunterdon Art Museum’s education programs and exhibitions of contemporary art, craft and design. 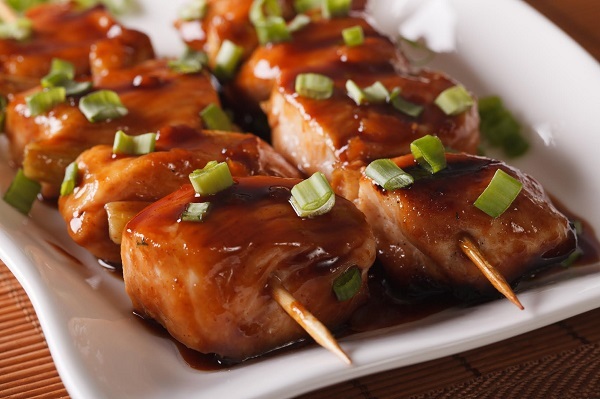 The menu features a culinary worldwide whirlwind tour of tapas perfectly prepared by 15 Landsdowne including Japanese negima yakitori (shown above), tandoori chicken kabobs, Nashville fried chicken and waffles, Cuban Lechón asado tacos and much more. See the menu here. Metropolitan Seafood Co. also will have its raw bar of clams, oysters, shrimp and crab. We'll have live music and dancing with La Vie en Rose featuring Simona, and a special performance by Samba Viva that you won't want to miss. We'll also have a silent auction featuring unique works of art and will be raffling off an amazing assortment of prizes including gourmet food baskets, a made-to-order coral, pearl and silver bead necklace, a bottle of Bordeaux and antique wine decanter, a beauty day at THE LOOK: An Aveda Hair Studio and more. ArtParty 2017: RED sponsors are: 15 Landsdowne, The LOOK: An Aveda Hair Studio, Metropolitan Seafood Co., Eggsotic Events, The Lucky Cupcake Company, Bourbon Street Wine & Spirits, Starr’s Party and Tent Rentals, Unity Bank, Basil Bandwagon Natural Market, Investors Bank, HealthQuest and Wegmans.